Ed Jones’ hopes of signing off the 2017 Verizon IndyCar Series season with a sixth top ten finish were dashed by mechanical misfortune at Sonoma Raceway last weekend, but the talented Dubai, UAE-born ace was nonetheless able to hold his head high at the end of an impressive maiden campaign at the pinnacle of US open-wheel competition. 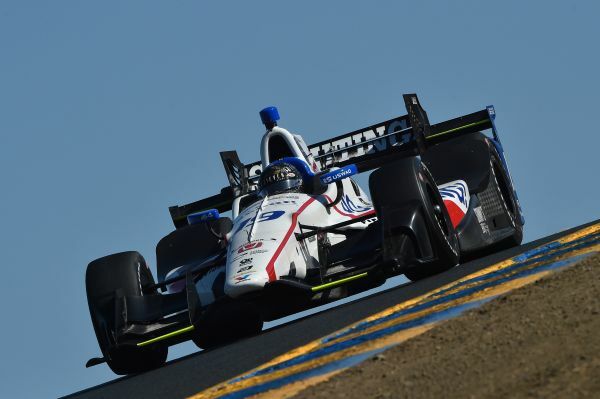 Having tested at Sonoma Raceway earlier this year but never previously raced there, Jones returned to the 12-turn, 2.385-mile northern California road course for the Grand Prix of Sonoma eager to produce one more eye-catching performance before the final chequered flag fell. The 2016 Indy Lights Champion and former European F3 Open Champion logged 42 laps over the course of a pre-weekend test day held in changeable conditions, placing 13th on the timesheets amongst the 22 high-calibre protagonists, but practice and qualifying would prove to be more of a struggle, leaving him a disappointed 18th on the grid for the race. Undeterred, a bright start saw Jones advance five spots on the opening lap to settle into 13th position, subsequently progressing further to run 12th. The 22-year-old Brit looked set to finish inside the top ten behind the wheel of his 720bhp Dale Coyne Racing Dallara-Honda single-seater, until a right-rear suspension failure just 16 laps from home spelt an early bath. "Sonoma was a completely different experience to the previous race at Watkins Glen, going from a super high-grip track to one that falls off really quickly,” he mused. “It was also very hot compared to Watkins Glen, where it had been on the cold side, so polar opposites really. “When we tested there, we had a pretty decent car but the circuit conditions changed a lot between the open test and free practice. There were also cars from other series that had been on-track in the meantime, and the different types of rubber laid down made it more challenging and unpredictable. “Qualifying clearly didn’t work out the way we had hoped. We had been aiming to be in the fight for the ‘Fast 12’, but we tried something in an effort to overcome the difficulties we had encountered in practice and while that helped in some areas, there were a few downsides as well. “I had a good start to the race and gained quite a few positions. I attacked really hard because I knew that would be my best opportunity to make up ground, and we ran 12th for a long time with pretty decent pace. The failure to finish was a double blow – quite literally – given that double points were on offer for the Grand Prix of Sonoma, restricting Jones to 14th in the final standings. 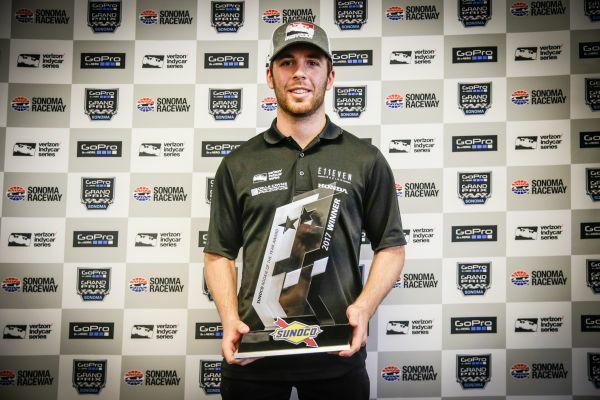 Nonetheless, after being presented with the prestigious ‘Sunoco Rookie of the Year’ trophy – and the $50,000 prize that accompanies it – the Williams-Harfield Sports Group protégé professed himself justifiably pleased with his achievements in 2017, capped by an outstanding third place in the legendary Indianapolis 500 back in May. “It's been a great year for us and it’s an honour to receive this award,” he enthused. “There are so many drivers in the past that have won it as rookies and moved on to be champions or won a lot of races, and I’m hoping I can be part of that story. I feel like as a driver, I got stronger as the season progressed. Early on, I had some great results and while I was driving well then, a lot of things also fell my way. Now, I think I’m better both as a driver and in terms of my bond with the team. “Coming through the Mazda Road to Indy was key to my success this year. Before 2015, I had only raced in Europe. Learning all the American circuits was very important for me, and to be able to do that in Indy Lights was really helpful. Without that, I wouldn't have been able to gain the experience I did, which is what makes the Mazda Road to Indy so relevant for young, up-and-coming drivers like myself.